If there are so many organs in Montpon-Ménestérol, we owe it to two artists, each of them in his art : one a great painter of the French Navy, the other, his son Francis, an international organist. With their eargerness to let the population of Montpon and its vicinity get to know culture and especially music, they have worked by creating the ACSM for the overhaul and enrichment of the organ of Montpon church; then with their energy and theit tenacity they have succeeded in getting the Ménestérol organ built. Francis has exerted himself in all respects and generously to creat this organ collection, unique in France, in the Auditorium San Francisco and in his house, and that still going on. This has permitted to get the town of Montpon-Ménestérol know in a lot of countries. Many organists or simple organ lovers and also music lovers have come and still come to see, to hear and play all these instruments. 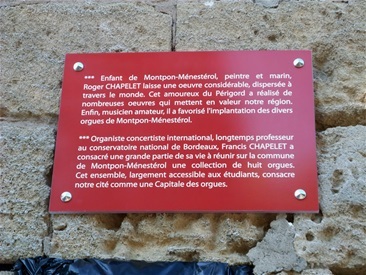 The Montpon municipality has wished to honour two eminent citizens of the town, to dedicate to them the place, in front of Ménestérol church, where Roger Chapelet planted a cypress. This nameloss place henceforward will be called : "L'Esplanade Roger et Francis Chapelet", since the 12th of june 2009. The inauguration took place after a memorial concert by Francis in the presence of the local and departemental authorities as well of the five foreign delegations and some officiers of the French Navy who had come to honour Roger and his son. Inauguration of the "Esplanade Roger and Francis CHAPELET". Plates appended on the wall of the steeple. Born on the 25th of september 1903 at Versailles but a native of Périgord, he encounteredthe marine world for the first time when going on the board the "Rollon" where his brother was an radio officer, in Marseille harbour.It was the outset of his career as a marine painter.At that time he made a set of paintings in differents harbours : Le Havre, Antwerp, Rotterdam, London ... He boarded a ship for the first time in 1929 to dicover new horizons then he got an sailboats to paint the fishing expeditions on the Banks of Newfoundland and in Greenland. In the 1930s he became the poster designer of main French Shipowners and in 1936 he was promoted to "Painter of the French Navy" and became a member of the Marine Academy. Invited by some shipowners he boarded some carge boats between France and Algeria. Then he travelled round the world on cargo-boats of course but also on three or four masters. During the second Worls War, he served between 1939 and 1945 as a supply officer of the Navy in the Meditarrenean Sea, then in Indochina in 1946, while keeping on painting different operations fields and naval engagements. Harvong return to the civilian life, he went being the poster designer of several compagnies : Compagnie Mixte, Paquet, Générale Transantlantique, Fraissinet etc. He retreated to Périgord in 1981 where he carried on painting seascapes but also landscapes and old buildings (churches, farmhouses in the Double, Pigeon lofts...) in the surroundings. Officier du Mérite Maritime, Officier du Mérite National in 1971, Officier de la Légion d'Honneur en 1974, Croix Navale de Vasco de Gama in 1982, Commandeur de l'ordre de Henri le Navigateur en 1992, he is yhe autor of "Un peintre et un Marin" and "65 ans de peinture" published by the Press de la Double in Montpon. 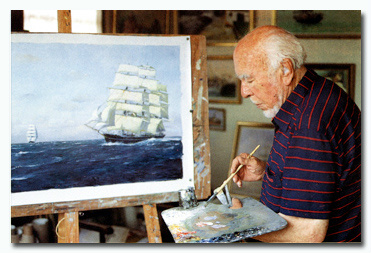 With Marin Marie end Albert Brenet, he is regarded as one of the three French great Marine painters of the WWth century. Exhibitions of his works are still made in several galleries nowadays. Born in Paris in march 1934, Francis studied music and the organ firstly at " l'Ecole César Franck" in Paris then entered the "Conservatoire National Supérieur de Musique et de la Danse". He was awarded the first prizes oh Harmony (Maurice Duruflé was his master) Organ and Improvisation. For twenty years he was one of the titulars of the Alfred Kern organ of St Séverin's church in Paris, an organ of which he has remained a honorary titular; he has been a member of the two organ commissions of the Culture French Departement. 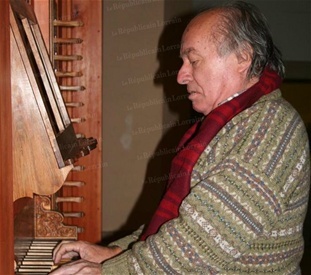 He is also a honorary organist of San Giovanni dei Fiorentini in Rome. He founded the organ class at the Conservatoire de Bordeaux and he was its master until 1996. Francis is well known as one of the specialists in the knowledge of the Spanish organ and he was the founder of the international Academy of the Iberian organ in Castille (where he owns a house). He is also corresponding member of the Royal Academy of Fine Arts in Madrid. Hawing worked with many organ-builder, he keeps looking after Montpon-Ménestérol instruments himself and embellishing them. He takes part in the field trips investigate the subsisting organs in South America (Peru,Bolivia...) - Latest CD on the organs of Cusco -. He has signed a great number of recordings many of which were prized, as well as some texts and studies about the Iberian Organs. He is "Officier dans l'Ordre des Arts et Lettres" and "Chevalier dans l'Ordre du Mérite". He keeps on giving many concerts throughout the world and he still the dynamic artistic counsellor of "L'Association des Amis des Orgues de Montpon-Ménestérol-Montignac".